Early in June a few things happen in Ohiopyle… All of the new river guides finish their training courses, all the stores and restaurants in town start staying open late, and the wildlife explodes in a rush of colors, pollen, and honey bees! There are so many different scenic hiking trails in the park that one would be hard-pressed to enjoy even half the trails in a day, and each trail seems to have a specific plant species that dominates your view as you wander through the woods. No visit to Ohiopyle, whether for rafting, kayaking, or biking, would be complete without some time set aside to experience some of the landscape by foot. To get you started, I’ll post some highlights of some of my favorites. Here’s a view of the start to the Ferncliff Trail as you step off the Great Allegheny Passage. The Ferncliff Trail runs the perimeter of the peninsula, hugging close to the river most of the time. As the name would indicate, ferns of every shape, size, and variety dominate the landscape. Quite a few fossils can be found embedded in the porous sandstone along the beginning of the trail as you approach the Falls. Look down as you walk and see patterns that look like tire tread in the rock. You are glimpsing the impression of bark from ancient palm trees that grew in this area during an era that experienced a very different climate! This trail runs close to the Falls area, offering an interesting view of the new Visitor’s Center construction site. Follow the black trail marker blazes and you will pass several frog ponds brimming with bulging tadpoles about to sprout their little legs! This section of the trail is where you will probably come across a fisherman or two dropping a line in the aerated pools by the Falls. Watch your step, as this area stays especially wet and muddy, particularly in the days after a rainfall. Copperheads, Timber Rattlesnakes, and Bald Eagles are also occasionally viewed along the Ferncliff Trail. There are three trails that zig-zag through the peninsula, branching off the Ferncliff Trail and connecting back to it again. Along with the many varieties of ferns that populate the peninsula, Pennsylvania’s state flower, the Mountain Laurel are quite prolific. The blossoms are so numerous right now, that is can seem like a soft blanket of snow is laying on the branches of this evergreen bush. Another favorite trail of mine is the Great Gorge Trail.You can pick up the trail in the Cucumber Run Picnic area and follow it all the way to the end, at the State Park Campground, (if you don’t mind hopping rocks to cross Cucumber Run where a bridge on the trail washed out in a big storm) or walk along the river back to Ohiopyle from the Cucumber Run area. If you start in Ohiopyle and walk across the High Bridge on the Great Allegheny Passage to hop onto the Great Gorge Trail you get to see a unique birds-eye view or Railroad Rapid in the Lower Youghiogheny. The best smell! Sweet and tangy! So, plan a couple of days to see all that Ohiopyle has to offer. 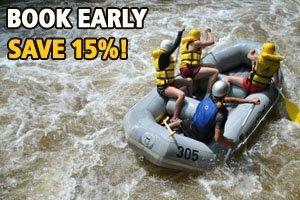 Rafting on the Yough, Biking on the Great Allegheny Passage, Zip-lining on Ohiopyle’s first Adventure Park, and hiking the 79 miles of trails in the one-of-a-kind Ohiopyle State Park. You won’t want to leave!